Sorry for the delay in recaps. During the premiere I was in Grand Cayman. Then somehow 'The Bachelor' did not record the second episode, which made me feel how Ashley S. feels at the end of the night. I was in traffic during the first 15 minutes and that would not mean anything if it was any other episode. Nothing ever happens except this time and I missed Kimberley asking to come back. First of all, if a person gets sent home on the first night they are a winner. Other than making it to final four, a person who goes home on night one usually does not make a fool out of themselves. The people who make it in between have no chance of being the next lead and a lot more opportunity to get a bad edit. It is not personal on the first night, if someone wants to be ruined, how about after the final three? Other than Kimberley, there were so many things about this episode, aliens, hairy confessionals and complete crazy moments. Part of the episode I was bored, then I was starving and finally I was amazed. I get the tractors and even swim suits. No one on this date seemed the least bit interested to be there though. Maybe they were looking for a country singer or helicopter. Then talk about a shocker, Mackenzie got the date rose. I did not see that coming, but more than that I did not predict the alien and nose talk. I am not sure if she was trying to prepare him for the child talk by blowing his mind with other subjects, but I was thinking 'is this real life?' She told about her Whole Food inspired tike, little Kale and got the rose. What is worse than sending someone who may or may not be mentally insane home? A person who just told about their child takes the cake in that scenario. Megan is the winner of the first date. Her hair looked fabulous, but was a little underwhelmed by the outfit. The helicopter showed up and I am certain I could never ever be on this show (even if I didn't have a boyfriend). I have to take Dramamine an hour in advance at least. They make it to the Grand Canyon and Megan tells about her father passing away. Chris seemed very empathetic and quickly followed with a kiss. First comes a kiss and then it's rose time. The zombie date is very fitting considering one participant in particular, Ashley S. Now I love this show, my blog's name is 'Bachelor Expert' because I take the show for its producing and editing, but still manage to like it. Ashley S. is the read deal though. There is no way that can just be editing. Whatever she is mixing should be the next Skinny Girl cocktail. She is a character out of a book. Seriously, if Gillian Flynn needs some inspiration she should watch this show. Then we have the victim of first impression syndrome, Britt. Chris turns into Jello when she is around and I am convinced his note to her actually said, 'save me from Ashley S. now. Kaitlyn gets the rose and Britt gives major side eye. I was full blown hangry and smelling my lasagna by this point. The things I remember are Ashley I. eating Chris' face, Jordan's own Jamie moment and calm Whitney giving him a bottle of whiskey. Whitney is normal and mentioned that her brother-in-law is from Iowa. She is in this to win this in the best way. 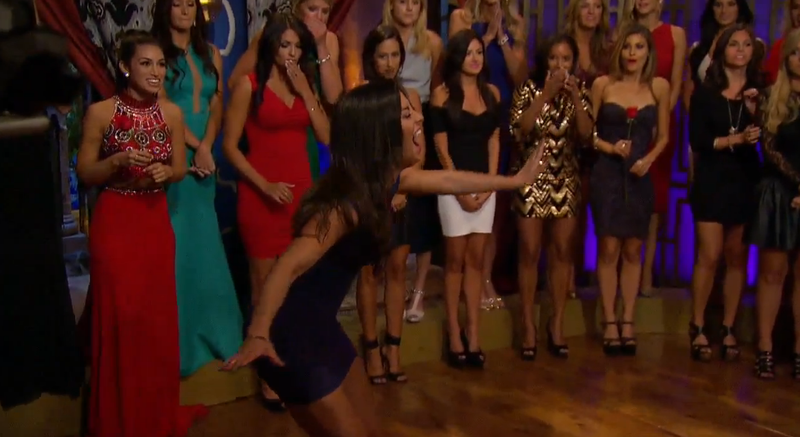 Jillian answering to the wrong name and then falling won this entire rose ceremony. Unfortunately, Kimberley got sent home again. The rest is a blur, I was eating dinner by this point. Luckily my recapping will be back on a normal schedule. You can tweet with me Monday night at @BachelorExpert. Photo rights belong to ABC/Disney Corporation.